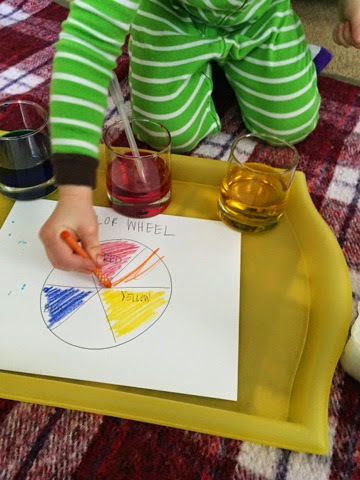 For older kids, it is also a great introduction to the color wheel and a lesson on primary and secondary colors. 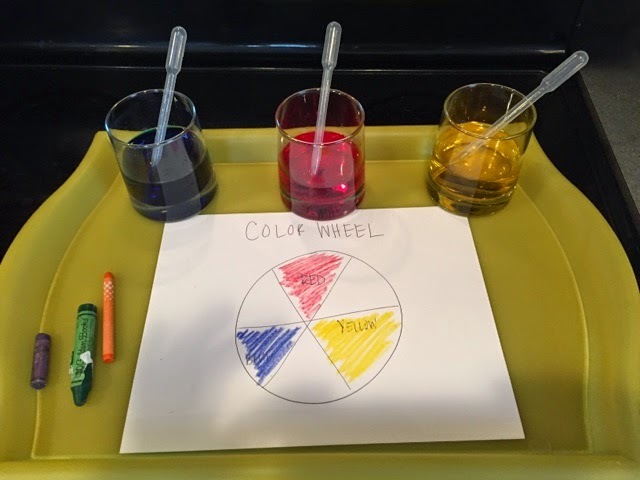 So for M, I made a very simple color wheel that he could fill in as he completed his science project. We like to pretend we are real scientists and make predictions and observations. I just used food coloring to make our primary colors and added some basic pipettes. 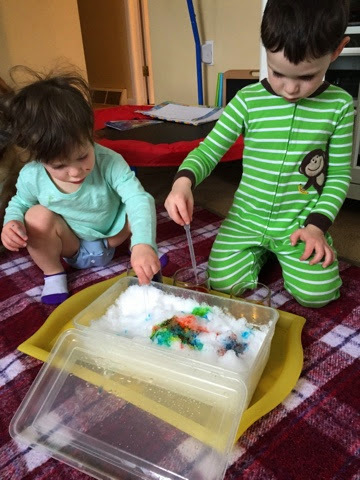 If you don’t have any eye droppers or medicine syringes you can just use spoons to add the colored water to the snow, but having these super inexpensive tools on hand is a great way for young kids to feel like ‘real’ scientists! We started by making our prediction of what red and yellow mixed together would become. Mack knows these combinations by now but still loves to pretend that he doesn’t and make his predictions. After mixing the two colors, M chose the correct color crayon and filled in his color wheel. 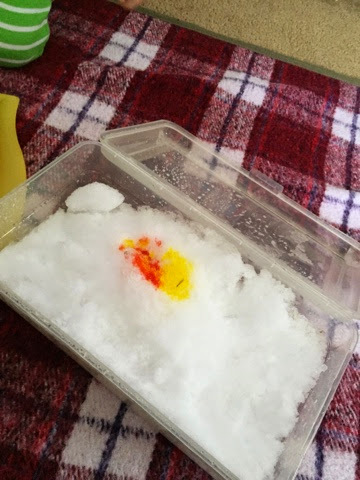 We continued with the other color combinations, and once our wheel was complete, we had fun dropping more water on to the snow and observing the rainbow that was now in our snow bin. 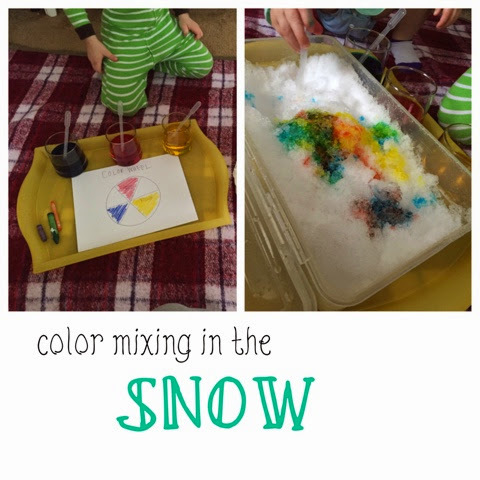 Ava enjoyed dropping the water in the snow and looking at all of the colors as well! 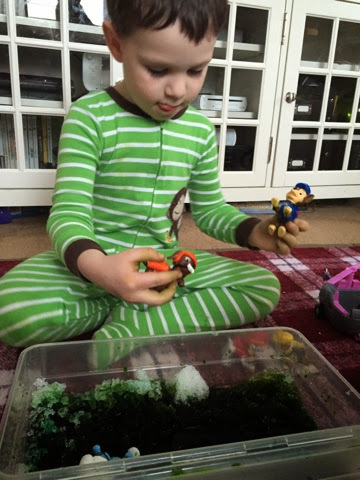 Once we had a greenish/brown slush in our bin, the kids decided to add some of their action figures and pretended that they were getting stuck in the swamp and needed rescuing. This was a good hour of educational, imaginative and fun play! !